With so many wonderful Maine-made products, it is easy to continue to support Maine farms throughout the holiday season. 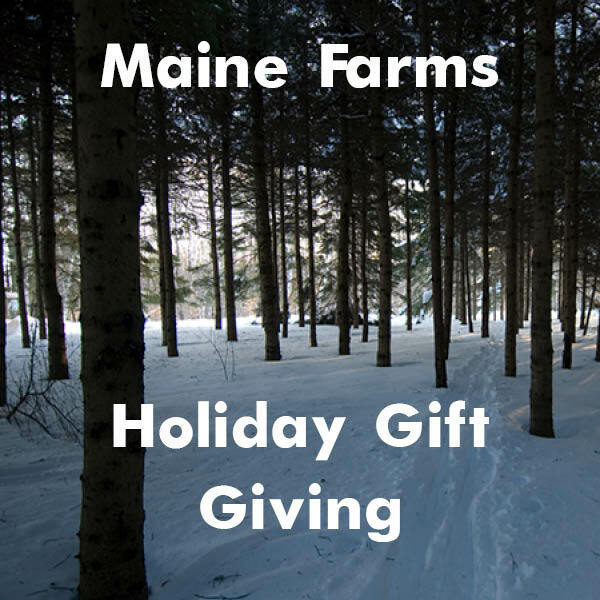 Add Maine farm goods to your holiday table and to your gift list! A CSA share: the gift that keeps on giving all season long. Click here for a list of CSAs in Maine or do a little research to see if farms near you offer CSA shares for veggies, meats, flowers, bread or other local goodies! Oils, soaps, tonics, teas and herbals with ingredients from Maine will help with the long winter. Check out: Herbal Revolution, Mikweed + Moth, Avena Botanicals, & Of the Spirit Herbals. Pick up some Maine-grown and made beer and wine for your holiday parties from Allagash, Rising Tide, Bissell Brothers, Oxbow, Odd Alewives, & Oyster River Winegrowers. You should also consider a jar of really good farm-made Milkhouse eggnog! Maine-made cheese is the perfect addition to any holiday gathering. Look at the map on the Maine Cheese Guild website to find a creamery near you and stock up on cheeses. Add to your holiday meals with some of North Spore‘s mushrooms and the growing kits make a great gift! A canner, or other kitchen gadgets that will help preserve food—so your loved one can enjoy Maine’s bounty year round. Here’s an overview of the products out there. Something to snuggle away the cold winter nights: a cozy sheepskin or wool from your local fiber farmer. Find farm-centric art, hats, t-shirts, children’s books, and holiday cards made by local artists in our gallery (97 Main Street in Belfast), or in our online store. Banked time: Because sometimes gardening, food preservation, or putting up a greenhouse requires more than two hands. Write out a gift certificate to wrap up, and throw in a sprig of thyme for fun. Give a gift certificate to spend at the local butcher shop. Looking for something to ship? Many of Maine’s food and farm products last a long time, including jam, maple syrup, beeswax candles, and even seaweed (the last two are even carry-on friendly!). Finally, MFT (and other farm-focused organizations) offer gift memberships. Give someone the knowledge that they have a hand in growing the future of farming. We’ll send them a copy of our beautiful Maine Farms journal, too! Most importantly, take time to enjoy this time with family and friends during the holidays. Be sure to stock up on all manner of veggies, dairy, meats, etc at your local winter farmers market or local grocer, and give thanks for local bounty, even in the midst of Maine winter! 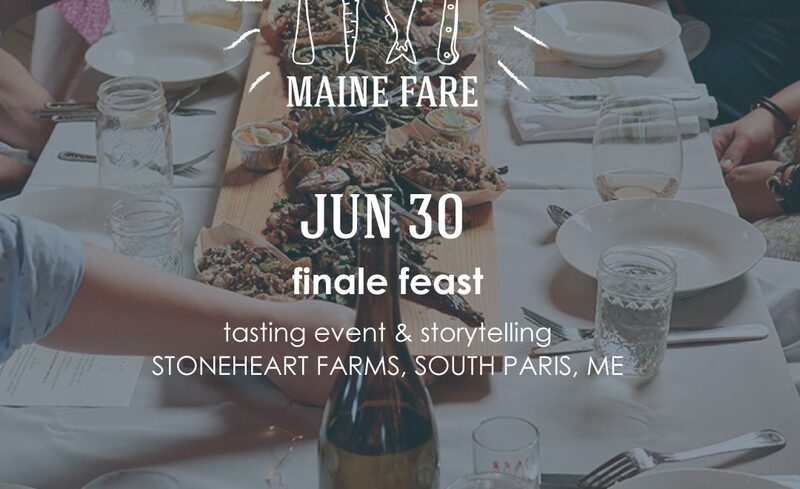 The Finale Feast will begin with a casual tasting of small plates that reflect the traditional foodways of Western Maine, using ingredients from local producers and prepared by some of Maine’s finest chefs. Each plate will be paired with a beverage (wine, beer, or hard cider- for those 21 & up). After filling our bellies, we’ll move to the Stoneheart Farm lamb barn (lambs included!) to hear food-focused stories told live by a lineup of local friends. Corey Dilts, chef at Norway Brewing Company, will be creating egg yolk raviolo, served with Tourmaline Hill Ricotta, six month dry cured Leg of Lamb from Wrinkle in Thyme Farm, maple chive cured duck egg yolk from his own farm, and a beet chive reduction. Ian Desjardins, a chef from the Penobscot Nation, will be creating a sample plate of fiddleheads, Passamaquoddy maple syrup, cornbread, and smoked Micmac trout. Shawn Stemp, chef at Ondine Oyster + Wine Bar and Black Trumpet, will be serving wood-fired oysters and accompaniments. Frank Giglio, chef at Three Lily Provisions cooking school, will be creating a lamb and mushroom ragu, served over acorn polenta. Lee Dassler. Lee has a background in theater, carpentry and architecture and is the executive director of Western Foothills Land Trust. Scott Vlaun. Scott is a photographer, homesteader, permaculture designer, dad and the executive director at Center for an Ecology-Based Economy. Mary Anne Haxton and Marty Elkin. Mary Anne and Marty own A Wrinkle in Thyme Farm in Sumner where they raise sheep and host fiber workshops. Bonnie Pooley. Bonnie taught at Gould Academy for 35 years, and is actively involved in local conservation and food initiatives, such as Mahoosuc Land Trust and the Alan Day Community Garden. + Storytelling will be emceed by MFT’s own Chris Franklin, our farmland protection project manager working in Western Maine! MFT members receive 10% discount on tickets. Not a member? Join today and receive 10% off your ticket! Check out the other Maine Fare events happening throughout the month! 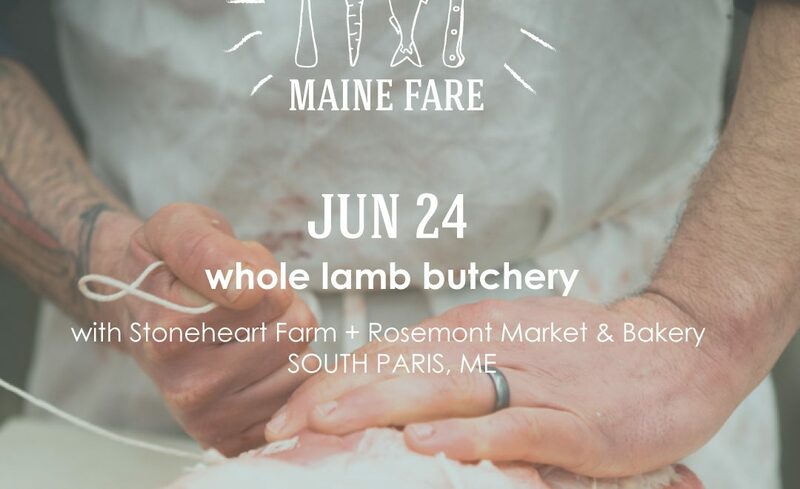 Students will learn from and work with butchers Elise Miller and Kirk Pincince from Rosemont Market to breakdown and butcher a whole lamb from Stoneheart Farm. Guests will get hands on cutting experience and will get to take home some of their handy work. Rosemont Market & Bakery is comprised of six markets in Portland, Yarmouth, and Cape Elizabeth, Maine. Since their start in 2005, Rosemont has become a significant hub for local food, sourcing fresh & delicious products from local farmers and friends whose practices they trust. Through their markets, Rosemont is working within their neighborhoods to instill a deeper, stronger understanding of where food comes from and what it’s really about. Gloria Varney at Nezinscot Farm will host a hands-on class that allows students the opportunity to gain skills and understanding of both soft and semi-hard cheeses. We’ll finish the process of making a dry-curd cottage cheese, a versatile cheese that can be eaten fresh or pressed to create a farmers-style cheese. Participants will also prepare goat’s milk to make a chevre and brie (or camembert). Everyone will leave with a sampling of cheeses to take home. 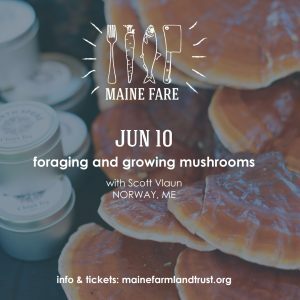 Scott Vlaun, the executive director at the Center for an Ecology-Based Economy in Norway, Maine, will lead a workshop on the basics of the mushroom life cycle, production, and different types of fungi, specifically oyster and shitake mushrooms. Participants will drill, plug and wax their own mushroom log to take home, and learn about log stacking methods, incubation and fruiting. 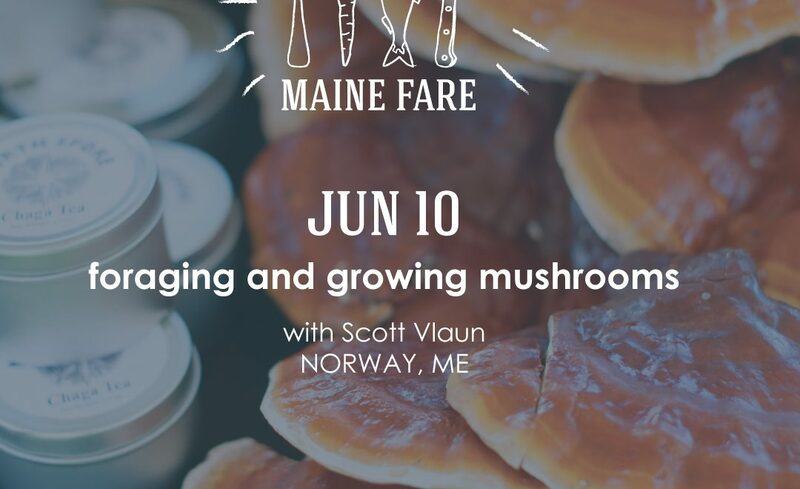 We’ll discuss foraging strategies and etiquette in the Maine woods and learn about some of the easy to identify medicinal and edible mushrooms. Make sure to check out our other Maine Fare events happening throughout the month of June! 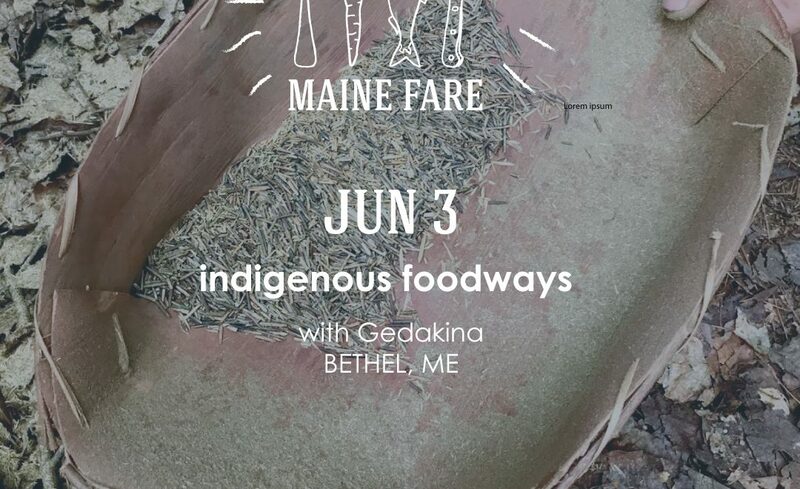 Karyn Marden (Abenaki descent), Ann Pollard-Ranco (Penobscot and Abenaki) and Alivia Moore (Penobscot) of Gedakina will give an overview of the history of indigenous food systems in Western Maine. The presentation will cover indigenous food system recovery work happening in different parts of the state, including a women-led recovery of traditional agriculture in Starks, and wild rice recovery projects. The presenters will also give an overview of other tribal food systems work happening in Maine and introduce some of the Wabanaki food businesses. Guests will have the opportunity to sample some foods from the tribal community, including a wild rice salad with squash and cranberries, and traditional cornbread. 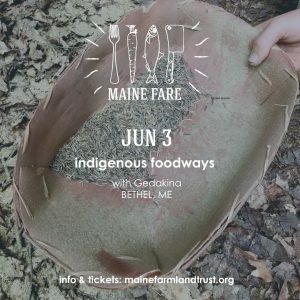 Maine Fare is a month-long series of hands-on field trips and workshops throughout the month of June, culminating into a unique finale feast on June 30th. Formerly a food festival that drew thousands of local food lovers to Belfast, MFT has re-imagined this popular event to provide more in-depth food experiences that highlight different regions throughout our state. This June, organizers have planned five events throughout the month in Maine’s western foothills region on various topics central to Maine’s food landscape. The 2018 workshops will cover topics that reflect the region’s unique food culture. Workshops include: indigenous foodways with GEDAKINA, mushroom foraging and cultivation, farmstead cheesemaking and lamb butchery. “Western Maine’s historic and current food system is defined by the geography and landscape– the woods, freshwater lakes and streams, and hillside pastures well-suited to sheep and other livestock,” says Meg Quinn, event manager at MFT. 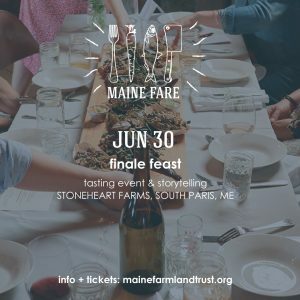 All workshops and the finale feast are individually ticketed, and tickets will be available April 30 on mainefarmlandtrust.org. MFT members receive a 10% discount on all tickets! click on the dates to purchase tickets! The presentation will cover indigenous food system recovery work happening in different parts of the state and offer the opportunity to sample foods from the tribal community. This workshop will focus on the basics of the mushroom life cycle, production, and different types of fungi- specifically oyster and shitake mushrooms. 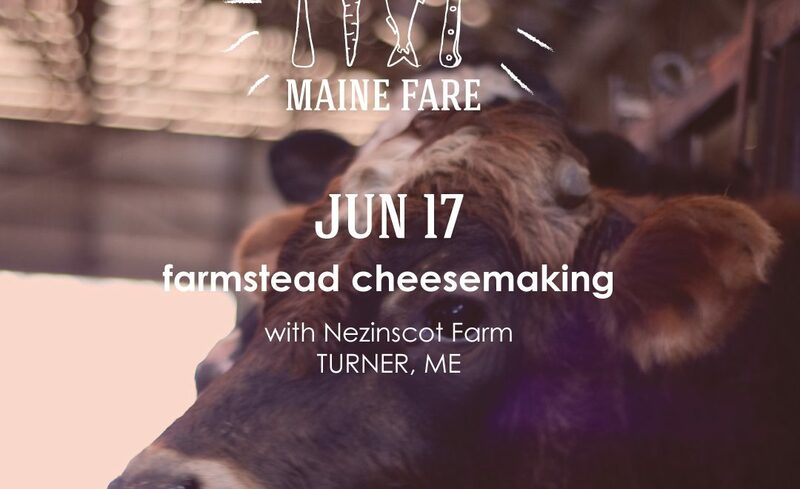 Nezinscot Farm will host a hands-on class that allows students the opportunity to gain skills and understanding of both soft and semi-hard cheeses. Students will learn from and work with a butcher from Rosemont Market & Bakery to breakdown and butcher a lamb from Stoneheart Farm. The event will feature a casual tasting of small plates prepared by some of Maine’s finest chefs, paired with local beer, wine and cider. This will be followed by storytelling in the lamb barn. In anticipation of our 2017 Maine Farms journal, we are delighted to share this exclusive recipe from Jim Amaral’s forthcoming cookbook, Borealis Breads: the Renaissance of Grains, due out September 2018. Amaral is the founder and owner of Borealis Breads and sparked the revival of local grain production in the 1990s. Wanting fresh whole wheat flour, Amaral began working with Matt Williams of Aurora Mills & Farm in Linneus to reestablish a grower network and processing infrastructure that had been lost. The growth of Maine grains continues today, and the 2017 issue of our journal includes Up in The County: from Spuds to Grains by Nancy Harmon Jenkins. Her article tracks the rise of grain production in Aroostook, driven by the growth of craft brewers, distillers, and bakers like Amaral, and the zeitgeist of the local food movement. The new issue of Maine Farms is ripe with stories from Maine’s vibrant farm and food landscape. Don’t miss it! Renew or join as a member today to receive your copy in the mail this July. You’re Cooking” in Bath; you could substitute a 4-cup Bundt pan, then covered with tin foil and secured with string. Grease the inside of a 1 quart pudding mold. Measure the dry ingredients into a mixing bowl and briefly whisk to distribute the ingredients evenly. In another bowl whisk together the molasses and buttermilk. Add the wet ingredients to the dry ingredients and using a spatula stir together until evenly combined. Pour the batter into the pudding mold and place the cover on it. If a cover is unavailable for the mold, cover it with tin foil and secure the tinfoil to the mold with a piece of string. Place a vegetable steamer in a large deep pot. Place the filled pudding mold on top of the vegetable steamer. Fill the pot with water till it comes 3/4 of the way up the sides of the pudding mold. Place a lid on the pot and bring the water to a slow simmer. Steam the brown bread for a total of 1 1/2 hours. After 45 minutes, top the water in the pot up so that it remains 3/4 of the way up the side of the pudding mold. When done, remove the pudding mold from the pot and remove the lid on the mold. Insert a thin skewer into the bread, the skewer should come out clean. Place the pudding mold on a cooling rack and let cool for ten minutes. Then using pot holders flip the mold over onto the cooling rack. The bread should slide easily out of the mold. 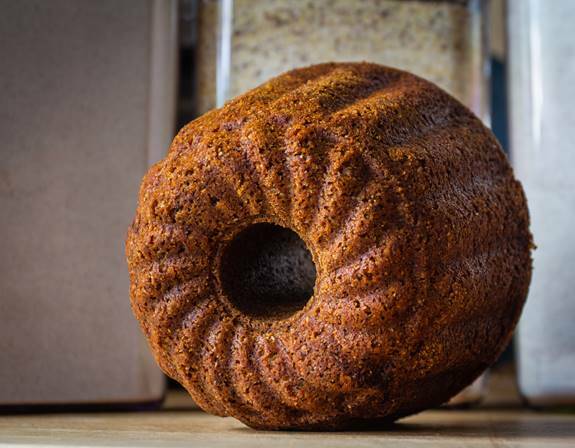 Both the whole wheat flour and whole rye flour are grown and milled by Aurora Mills and Farm in Linneus, Maine. They are available at many food coops around the state in the bulk foods sections. The Abenaki flint cornmeal is is grown and milled at Songbird Farm in Unity, Maine. This cornmeal is packaged in 2 lb. bags and is available in many food coops as well. Due to concerns over the chemicals such as bisphenol A used in can linings, Amaral recommends steaming the brown bread in a pudding mold rather than in tin cans which have been traditionally used for brown bread molds. 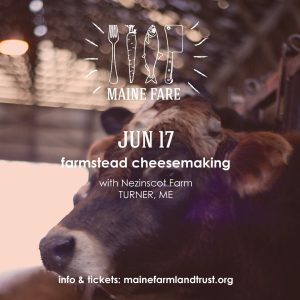 Maine Farmland Trust’s signature food festival has evolved and taken on new life as a month-long series of hands-on field trips and workshops throughout the month of June, culminating in a unique, collaborative dinner on June 25, 2017. June 24: a boat trip down the Damariscotta River to visit oyster farms, taste oysters and local beer, and learn about the river harvest, past and present. At the end of the month, on June 25, chef Sam Hayward of Fore Street will lead “Food for Thought,” a collaborative dinner at The Freight Shed in Bath. 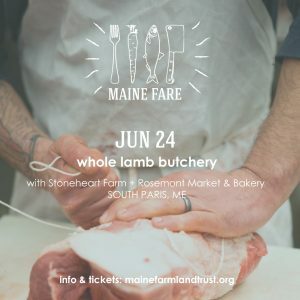 The dinner will serve as the finale of a month of workshops celebrating Maine’s bounty, with four courses prepared by Hayward and a team of guest chefs, including Nate Nadeau, Fore Street’s Chef de Cuisine, Josh Potocki of 158 Pickett Street Cafe and The Bread & Butter Catering Co., Eloise Humphrey and Daphne Comasky of Salt Pine Social and El Camino, and Ben Hasty of Thistle Pig. The menu will reflect the topics covered in the workshops, as well as Maine’s traditional foodways. But the evening isn’t just for enjoying a wonderful meal. As the name implies, it’s also meant to provide plenty of food for thought. Following a cocktail hour cider and cheese tasting, guests will engage in a discussion-based “Jeffersonian-style” dinner party. Each table will have a topic to discuss related to Maine’s food system, and all guests at the table will participate in conversation around that topic. The evening is designed to encourage deep conversation that takes full advantage of the different perspectives and collective wisdom of the dinner guests. The Freight Shed, a historic building once used to weigh and store railroad freight on the Kennebec River, “is a great setting for this dinner—a reminder of the myriad of connections between land and sea, the elements at the heart of Maine’s food culture, past and present,” said Quinn. All of the 2017 Maine Fare events will take place in the Southern Midcoast area – Lincoln and Sagadahoc counties. “We like the idea of moving this event around the state each year to highlight local food in different regions of Maine,” said Quinn. All workshops and the dinner are individually ticketed, and tickets will be available April 24 on mainefarmlandtrust.org. MFT members receive a 10% discount on all tickets. 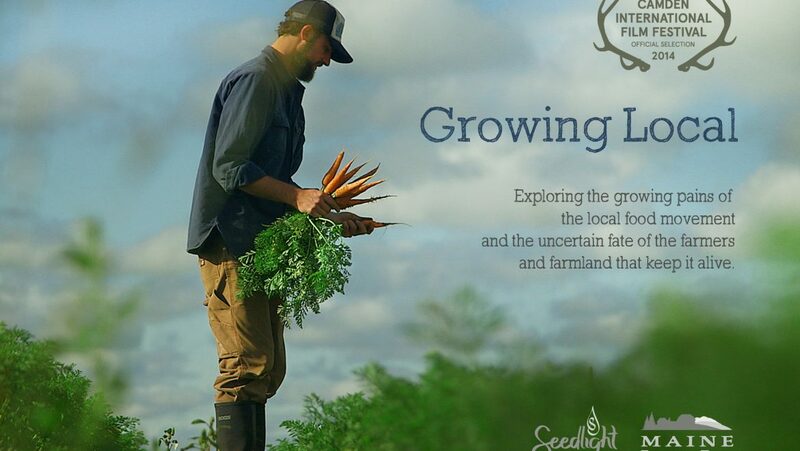 Join Spice & Grain Natural Market, Fly Away Farm, MFT and others for a screening of Growing Local at Charlotte Hobbs Memorial Library in Lovell. MFT Lands staff member Chris Franklin will lead a Q+A discussion after the film. Light refreshments provided.